Nepal is among the best destinations in the world to travel to with children. A tour to Nepal is bound to be a great adventure for children and parents alike Traveling with family is now becoming more popular in Nepal . Our family tours and treks are especially designed to be private tours for family with children and it is perfect way to introduce kids to the Himalayan wonderland.The family can relax and have fun together during the tour, and you will have the opportunity to share exploring Nepal with your family and learn about the Nepalese culture and nature.The trek described below does not entail any particularly long walking days and there is always plenty to see. Accomodation will be at Teahouses in villages along the trail which our company have ascertained are clean and comfortable the trek involves no difficult climbing or ascents to high altitude.The trail passes through Rhododendron forests and fascinating traditional Gurung villages at Dhampus & Ghandruk. This opens up a great opportunity to witness the culture and tradition of the Nepalese people who live in this area this trek affords fine views of the Annapurna Range the walk starts from Birethanti and ends at Phedi From the famous Gurung Village of Ghandruk you will see breathtaking views of Annapurna South, Gangapurna, Annapurna III, Machhapuchhare and Hiunchuli the trail continues to a natural hot spring at Jhinudanda. After the trek you will take a fun and safe easy rafting ride in the Trishuli River Following this adventure your tour will visit to the Chitwan National Park, where exotic wildlife roam freely, and you can safely view all kinds of wild animals from a platform on an Elephant's back. You and your children are gauranteed to have a lot of fun and excitement during this final stage of your tour as you try to identify the different animals in their natural habitat, including the nearly extinct One Horned Rhino, and the Bengal tiger. Day 01arrival at Kathmandu Airport: We will meet you at the Kathmandu Tribhuvan International Airport and transfer you to your hotel. When you have had time to settle in and freshen up after your long flight, you will be invited to visit our office for a briefing about your programme. During this visit we will help you check your equipment and facilitate the processing of other necessary items such as National Park Permits etc. Day 02A full days sightseeing tour of Kathmandu valley. The next morning after breakfast you will leave for a full days tour of sightseeing around the Kathmandu valley. You will visit the Hindu temple complex at Pashupatinath (a UNESCO World Heritage site) & the biggest Buddhist Stupa at Boudhanath. You will also visit Swyambhunath, also known as the Monkey Temple, a 2000 year old temple, and visit Patan City, famous for its fine arts and and historical architecture. On return to your hotel you will have time to explore the local area, have dinner and perhaps take a leisurely stroll through the famous Durbar Square. Day 03Flight to Pokhara: Sightseeing and boating on Phewa Lake. After breakfast we will drive you to the Domestic Airport to take a 25 minute flight to Pokhara. During the short flight to Pokhara you will have majestic views of the glorious Manaslu peaks and the snow-capped Annapurna mountain range, as well as the Langtang Himalayan range. Our Staff will meet you at Pokhara Airport and take you to your hotel. After having a rest in the hotel and lunch, a sightseeing tour of Pokhara is in the program. The tour includes a visit to the Devi Falls , the gorge of the Seti River , and the Tibetan Refugee Camp. A boating trip on Phewa Lake will follow where you can enjoy the spectacular views of Annapurna Himalayan Range reflected in all it's glory in the calm green waters of the lake and visit the temple which is only accessable by boat. Day 04Pokhara to Ghandruk (1950m): An interesting drive of one hour and forty minutes will bring you to Nayaphul. It is here you will start your trekking adventure. The first vilage after Nayaphul is Birethanti (1065m height). We will walk along the trails between the terraced fields, always beneath the splendid panorama of awe-inspiring glaciated Himalayan Mountain Ranges. After passing a flatland, forest, cultivated land and a suspension bridge over Kimrong Khola, we will arrive at the beautiful village of Ghandruk after walking for 3 to 4 hours. An ideal vantage point in this pristine village offers breathtaking views of Annapurna South, Gangapurna, Annapurna III, Machhapuchhare and Hiunchuli. There will be time to explore, rest, and enjoy some lunch, before settling into your accomodation for the night. Day 05Ghandruk to Jhinu Hot Spring (1750m): Meandering along a flat trail for an hour before passing through terraces, streams and green scenery will be an easy start for your walk today. We will walk down to Kimrung Khola, and from here the trail starts ascending in a gentle incline. You will walk through Rhododendron forests, and the neat agricultural terraces of the locality. We will stay in the village of Chhomrong (2040m) for the night, here you can see the mighty peak of Annapurna South towering above the surrounding villages. Machhapuchhare (also known as Mt Fishtail) faces Annapurna South across the valley, and from here you can also trek down about 1 hour to Jhinu. A Natural hot spring at Jhinu is an inviting place to spend time splashing in the small pool beside the natural hot spring. Day 06Jhinu Hot Spring to Pothana (1990m): After breakfast next morning, the trail continues on to Landruk, a beautiful Gurung village which provides you an excellent view of the surrounding mountain ranges. The trail emerges in the main Modi Khola valley and reaches Tolkha. After that we will continue on to Pothana. You will have a excellent view of Mt Fish tail ( Machhapuchhare 6697m) from here. Day 07Pothana to Pokhara: Today we will walk along a paved stone trail through Rhododendron forests arriving at Dhampus (1750m). This village is inhabited by a mix of people from different Nepalese cultures, Gurung, Brahman, and Magar communities. After a rest here we will walk mostly down hill through fields to the forest and on to Phedi. From Phedi there will be a 30 minute drive to Pokhara. Day 08Free day at Pokhara: You will be free to explore Pokhara and the surrounding area at your leisure. Taking a taxi to the village of Sarankot before sunrise will afford you spectacular views as you see the sun rise, draping the great Annapurna Range in a golden, deep purple, and rose cloak, before the brilliant clear blue sky emerges for you to enjoy the rest of your day. The Peace Pagoda funded by Japan is another spectacular viewing point over the valley, with Pokhara and Fewa Lake nestling far below. Day 09Rafting on Trisuli River and Drive to Chitwan National Park: Early in the morning we will travel by tourist coach, car, and private bus the 78 kms East from Pokhara to our point of departure for our rafting adventure, at Charaundi Village, on the bank of the Trisuli River. Before deparure on our river trip everyone will be fitted with a life jacket and helmet. The trip leader will inform you about river safety, paddling techniques and what to do if you find yourself in a situation where you fall overboard. We begin rafting in a languid pleasurable fashion to get the feel of the motion on a raft. The scenic passage past the river banks and the life taking place along the way is interesting and intriguing, an added bonus to the rafting experience itself. Around mid day we will head to Chitwan National park . On your arrival at Chitrasari we will collect you and transfer you to our Resort. You will be offered a welcome drink, and a briefing about the next few days program. Day 10Full day jungle activities in Chitwan National Park: Today you will have a full day jungle excursion including an Elephant back safari, canoeing, a Jungle walk, a visit to the Elephant breeding centre, a sunset tour, and an ethnic village visit. Day 11Jungle activities and Fly to Kathmandu In the morning you will be free to go on a nature walk and have an opportunity to do some bird watching. After lunch we will take you to the Bharatpur Airport for a flight to Kathmandu . On arriving in Kathmandu we will take you to your hotel for a well earned rest! Day 12Morning Mountain flight and leisure time The following morning after breakfast we will drive you to the Kathmandu Domestic Airport for a 1 hour scenic Mt Everest flight. 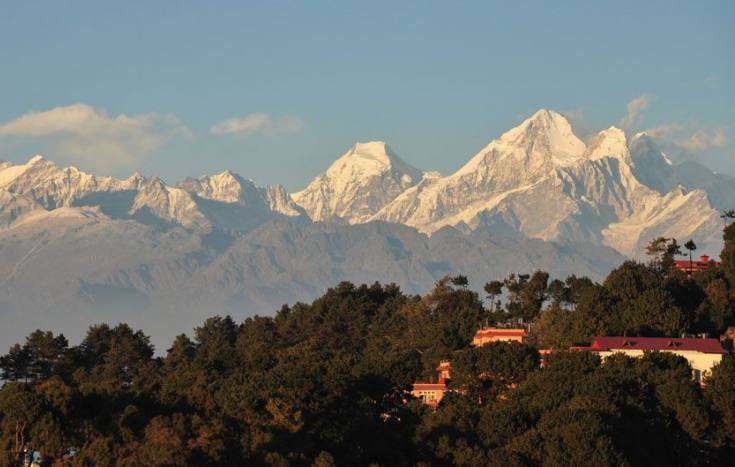 The outstanding views of Mt Everest towering high above the other high Himalayas will be a highlight of your last day with us. After arriving back at the Kathmandu Domestic Airport we will return you to your hotel and you will be free to spend the afternoon shopping, enjoying the local culture and food and browsing the shops. Day 13Departure from Kathmandu "Farewell" Final Departure. If you are leaving Nepal and not continuing your holiday here in Nepal , we will take you to the Kathmandu Airport to catch your flight home. Our staff will oversee your safe and timely arrival at the Tribhuvan International Terminal and help you arrange your last minute departure details. We will wish you a happy journey in the traditional and cultural way of Nepal and hope to see you again!